I have a new Ask Cloud question, and it is a hard one. I'm really hoping my readers can help out! "I read your book [Note: that would be Taming the Work Week ] and a lot of your blog posts on productivity. I need all the advice I can get on being productive and keeping the work hours sane. One thing that I keep seeing are making lists (daily lists... weekly... long-term). Lists do not work for me! I write things down and then I forget where I wrote things down/never get around to actually looking at the lists/priorities change and yesterday's lists become obsolete. Do you have any suggestions for further reading on productivity/project management for people who are list-averse?" "My goal is to use time wisely. I am somewhat disorganized and I am horrible at strategy. There are all these different things (sometimes from different projects) that have to be done. I end up wasting a huge amount of time because I tend to forget that before starting thing A, I need to prepare B, C and get G. I drive 30 minutes to get G, but forget to ask about X and Y for project Z that I will need to start in two weeks. I am good at concentrating and working on things that are right in front of me, but anything that requires strategic planning is a challenge... I've tried making lists, but my brain just doesn't seem to be all that compatible with lists. I either forget I made a list (and find it months later), or can't find it, or don't have it with me when I need it. I can function reasonably well in [my] "as is" state, but I do waste time that I'd rather be spending with the family... or reading... or sleeping. So, I am wondering - is there a method for planning projects and managing time, other than making lists?" This is a hard question for me to answer, because I love lists! But I'll take a shot at it, and then I encourage my readers- particularly anyone who doesn't care for lists!- to weigh in. I think List-Averse is off to a good start by recognizing what doesn't work. Too often, we are looking for a sort of one size fits all "trick" that will make this stuff easy. But improving productivity isn't easy. I still work at it, and I've been paying attention to my time use and productivity for years. So don't feel bad if it feels hard. It is hard, but (at least to me) it is worth the effort, because the reward is the feeling that you're spending your time on the things that matter to you. OK, so what could List-Averse try? Here are my ideas, in no particular order. I've noticed when I work with people on project management that some people who hate Work Breakdown Structures (the list-like "project plans" you often see) and Gantt charts really love card based systems like Trello. Maybe it is something about the visual nature, or the fact that you can organize your cards in multiple ways? I don't know. I use both Trello and work breakdown structures. To me, one isn't better than the other- they have different strengths and weaknesses, and I use them in different situations. I've yet to find a tool better than a WBS for tracking dependencies, but I love the less-structured format of Trello for capturing my backlog. I have one "Master" board for the things that I'm working on now or will be working on soon. It has lanes named: Prioritized, This Month, Doing, Parked, and Done. I have a board for each area of focus, which right now means: Annorlunda Books, Design (i.e., my Etsy store), Tungsten Hippo, Writing, Consulting, and Overhead. I've set up labels that match the areas of focus. This allows me to "tag" the cards on my Master board so that there is a color code for the area of focus the card relates to. When a new idea occurs to me or I decide I should do a new project, I add it to the appropriate board. If it is something I'll do "soon," it either goes in the Prioritized lane of the focus board or the Prioritized lane of the Master board, depending on how soon I think I should do it. This is not an exact thing. If it is something I'll do this month, it goes in the This Month lane on the Master board. If I'm already doing it, it goes in the Doing lane on the Master board. Once a week or so, I open up my Trello board, move things to Done or Parked, and move the other cards around based on my plans. I move things from the focus boards to the Master board as needed, and then add a color coded label. I also think a bit about what I should be doing, either now or in the future, and make cards for those. I consider this time spent on short term strategy. Every once and awhile, I move things from Done on the Master board to Done on the appropriate focus board. This serves no real purpose but makes me happy. I consider my Trello board to be my "grand plan." I know some people manage their day to day work off of a board, but I don't. I manage my day to day work off of an old school list on paper. I use a small spiral notebook these days, because one of my kids gave me a small spiral notebook as a gift (I can't remember for which occasion- probably my birthday or Mother's day last year), and this was my idea of how to use it. It has worked out really well. I currently work from home on my own projects (i.e., not onsite and a client) on Wednesdays and Fridays. I also generally spend an hour or two on the other days on my own projects. 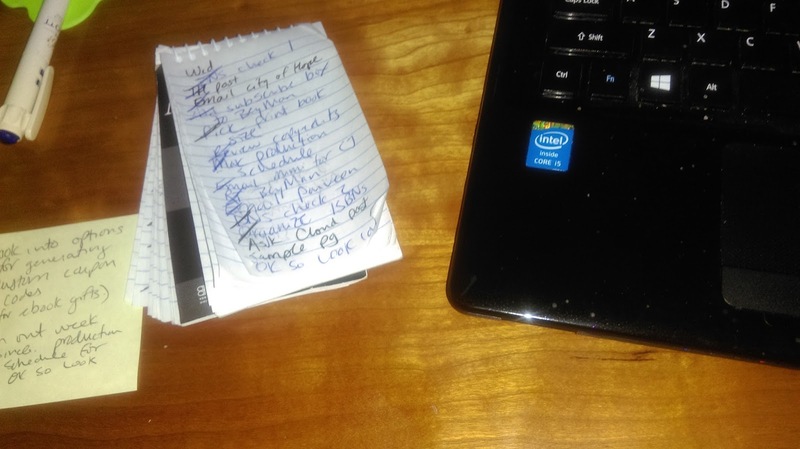 So right now, I make a page for Monday-Tuesday, a page for Wednesday, a page for Thursday (but it is a short list), a page for Friday, and a page for Weekend (this list might be empty or have only "fun" work, like writing blog posts, unless I'm on a crunch time). My daily to do lists don't always get completed, but when they don't, I spend the last little bit of work time that day looking at what didn't get done and moving it to another day's list or consciously deciding not to do it right now. I have a similar set of lists at my desk onsite with my main client, for the work I do there. I am painfully aware of the fact that my first two ideas are essentially "make different lists." Like I said at the top, I'm genuinely struggling to come up with other ideas for remembering what you need to do and having a more strategic approach to time use. If you can take the same basic idea and expand it to cover more aspects of the things you need to do, you might find that the frazzled feeling calms down, and you're more confident that you aren't forgetting things. One theme I noticed in List-Averse's emails was that lists got forgotten or changed... and that was bad. I wonder if the problem with lists is that they seem like a prescription instead of a plan? I change my lists all the time. I scratch things out on my written lists (a line all the way through an item means "I'm not going to do this") and I delete things from Trello or kick something I put in Prioritized back to To Do. My lists are a commitment I make to myself. If I decide that the commitment needs to change, I can change it. Also, I have gone to the grocery store many times and realize I left my list at home. But I'll shop anyway, and usually I get most things that were on my list. The reason for this is that writing something down helps me remember it. So even if you lose a list you wrote, it might have helped you remember what you needed to do. Maybe you will feel better about lists if you let go of the idea that there is a "right way" to use them? I don't know, though... List-Averse, I'm reading a lot between the lines in your emails, and this suggestion may be way off base. Please disregard it if it doesn't ring true to you. If you lose your written lists, try writing them on a sticky note and sticking them in the appropriate location. I tend to stick lists to my laptop lid a lot. There are also a gazillion to do list apps these days, and perhaps putting one of those on yoru phone would solve the problem of not having the list when you need it. Another technological tool that might help is Google Docs. I will sometimes start a document with some free form notes about a project idea. Then, when I'm ready to start the project, I search Google Docs to find the document and use it as a starting point. I know of some very productive people who do not use to do lists. They say that it is always obvious what they should be working on. This works for them because they have managed to arrange their work life such that they can focus on one or maybe two projects at a time. They do a "deep dive" into their project and so it is always obvious to them what the next priority should be. Not everyone can set up their work life in this way, but we can all try to mimic it, by limiting our "work in progress." Like I mentioned above, I like to have about five things in flight. That is a fairly high number, but it works for me. Maybe List-Averse is someone whose natural "work in progress limit" is closer to one or two. People who have low "WIP limits" can sometimes mimic the "one project a time" work situation by have a backlog and only pulling allowing one or two things off the backlog at a time. The backlog is just a to do list, but it is a to do list that you specifically are saying you aren't going to do right now. I think of my deep backlog (the To Do lanes in Trello) like an external memory bank. I store things there so that I can take them out of my working memory. If you can do this and only have one or two things in progress at a time, the backlog might be the only list you need. To tackle the problem of forgetting that you need to do A and B before you start C, try occasionally performing a mental check. Maybe do this first thing in the morning, or before sitting down to start work for the day, or whenever you feel like you are mentally freshest. Think about what needs to get done, and then take a minute to think about anything you need before you start. This is like a mental version of the chef's practice of gathering all your ingredients before you start. That's all I can come up with, so readers, it is your turn? What ideas do you have for List-Averse? Great post with a lot of really good suggestions even for people who love lists. Sounds to me like there are two things going on. 1. Keeping track of the list and 2. possibly being a global thinker instead of a linear thinker. Like you note, 1 can be solved with an electronic place to keep lists like google docs or something on a smartphone. 2 is harder -- it is a different way of thinking, one generally associated with creativity but not so much jobs that require a lot of program management. There must be a solution to #2, but heck if I know, though now that I think about it the reducing the things in flight seems to be what successful "global thinkers" I know tend to do (though they also sometimes drop balls and rely on other people to work around them). Or if they're very rich (or work at Harvard) they hire a personal assistant to take care of scheduling. I'm not familiar w/linear vs global thinker research- I'll have to look into that. I am always looking for things to help me better understand the different ways other people might be processing info or viewing things. I think that makes me a better project manager. I also found this post incredibly helpful. I'm still working my way through the links to older posts. One low tech idea that I use is a monthly calendar rather than a master to do list. I print each month on a single sheet of paper. Having just one box per day limits the detail but helps me keep the big picture of, for example A needs to be done before B and C is due on Friday. I work with a lot of pretty long term deadlines so having 3-4 months printed out really helps me see the spacing of deadlines and events in ways that lists, apps, and small laptop screens don't. I use calendars, too! In fact, I just printed one for the next few months and scheduled in what I need to work on each week. I have a talk in mid-Sept, a book release in mid-Oct, and a class I want to give in late Oct. I needed a schedule or I'd get lost! I use calendars a lot when I'm running multiple simultaneous projects. Thanks for the link! That looks helpful. Oh, yeah- mindmaps! I've seen people use them, particularly when sketching out a new project. I am a list hater. What info is I put things like doctors appointments and meetings in the calendar on my iphone; I have found that to be the only way I don't absolutely hate entering appointments. Then I forget about them, as I set two alarms to remind me. Everything else is in my head. On my research projects, it's obvious what I should do next or what I crave to do, so that's what I do. As for teaching, that's a regular schedule, so I also know what comes. As for service, it's either an appointment so in calendar or something I need to do but generally avoid to, so it stays on my mind until I feel like I have the mental fortitude to do it. As for kids' activities, those go on the big write/erase board in the kitchen. If I could have my way, and ideal list would be a 3d object that can be populated by floating tasks where each task has size, shape, and color associated with importance, type, and amount of work, and they would be able to float around as priorities change, change their attributes, and also require no effort from me to enter info -- basically they would get put in directly from my brain. Obviously this is not happening except in my head. I have now officially added you to my list of "very productive people who hate lists." Thanks for sharing your tips! I am not sure I am worthy of making it to the highly productive list, but I will take the compliment -- thanks! I have to write things down in order to remember them - once I get it written, I usually remember it. It's not exactly a list though. I don't go back and prioritize things. It more just jogs my memory. From my perspective, the most important thing is to focus on the One Main Task I'm trying to accomplish and make sure I have all of the things set to get that one thing done. So even if I'm batching errands along the route to/from the dog food store, e.g., the one main thing is that I Get Dog Food. As long as the priority task gets done, I am not allowed to get mad or disappointed if other things I wanted to do did not get done because I forgot x, y, or z - or just plain forget them entirely. Your point about not beating yourself up for forgetting something is a good one. Even with all my lists and calendars, sometimes something gets forgotten. I tend to get really mad at myself when that happens, but that is counter-productive. My advice would be to go visual/physical: sticky notes on a wall that can be peeled off and taken along, so when you pick up the list that includes "go get G" it also says "ask about X and Y." Along the lines of noticing what doesn't work, maybe keep a record of what does. That is, if there's something List-Averse always does well without thinking about it or losing pieces of it, what is that thing and how does it work? It might be like xykademiqz's grocery shopping, where she always gets much the same stuff and plans meals on the fly; and if so, then think about whether there are ways of systematizing other projects in a similar way. Or maybe there's a way of making more pieces of a project be "right in front of me," so that you can think of it as One Big Thing instead of lots of little list-y things. Since List-Averse asks about work, I wonder if there are workplace strictures that make it harder to work in a way that works for her/him. If desks are supposed to be kept clear, for example, that is very hard for a visual/physical person to do while being productive. My desk is piled with books right now, all of them relevant to a particular piece I'm writing; I have to have them, and their sticky notes, to remind me to put in various quotations and citations. I could write out these bits in a separate document and check them off, I suppose, but my piles work much better for me. Seeing my desk might drive someone else crazy, though, so if a boss is a neat freak, that really is another whole thing for L-A to manage. The thought of a boss telling me how clean to keep my desk makes my blood boil. I love lists, etc., but my desk is always a mess and always will be. Except for the day or two after one of my big cleaning sessions- when I'm stuck on a problem or trying to think something through, I'll clean my desk to keep my hands busy while my brain chugs through the problem. I just noticed another thing I do that helps: narration of upcoming tasks in a journal. I was writing about what I have finished today, and what I am going to do next, and realized that in order to do one errand well, I should pack up something at home and take it along. Just looking at a list wouldn't have pointed that out to me, whereas trying to create the narrative makes it clearer, somehow. I also hate lists, but sometimes do find them helpful - for example when I've got a lot of small, unconnected things to do. If I start by writing a list, then I don't waste time between tasks trying to figure out what to do next. Mainly what I do is use Google Calendar to schedule things. I also put things like "Set up schedule for x" into my calendar. Then if something doesn't get done on a particular day it is easy to shift it forward to a day it will get done. I also keep a pile of "current" stuff on my desk, and try to tidy the desk once a week. That way if there's something that needs dealing with, but I can't do it right away (often I just don't have all the info offhand) it will turn up on its own once I tidy. Key here is to tidy my desk regularly. Every so often (once a week ideally, once a month realistically) I write out a serious to-do list in my lab book. It is always in the same place and gets a date on it. When writing this I'll refer back to the previous one. I don't usually cross things off these lists, I guess they're more plans than lists. They also include stuff I'm waiting on from other people, so as I write the new list I'll often email people to find out what the status is on the thing I'm waiting for. I find that in order to work for me, this has to be hand-written and in a consistent location. Electronic lists accumulate junk. If I have to write it out, it is something I definitely intend to do, and somehow sticks in my mind better - the physical action of writing, the location of the list, pausing while updating it to actually schedule particular tasks, being able to refer back to previous lists.